See Dirt Run! 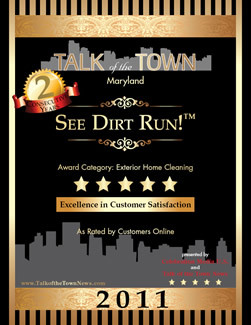 ™ Inc. of Germantown, MD., honored by Talk of the Town with Second Consecutive Five Star Award in Maryland for Exterior Home Cleaning during 2011. See Dirt Run! ™ Inc. was again selected as the top rated company for the second consecutive year in the Exterior Home Cleaning category for services performed during the year of 2011. Germantown, MD – March 9, 2012 Talk of the Town honors companies that consistently receive excellent reviews by consumers, looking at various sources for Annual Reviews. See Dirt Run!™ Inc. of Germantown, MD. received five star ratings for the 2010, and again in 2011 earning them the Exterior Home Cleaning Award for two consecutive years in a row. See Dirt Run!™ Inc. cleans many different types of residential exteriors, such as vinyl, aluminum, brick, stone and stucco, but specializes in log and cedar homes. The company also cleans decks, fences, deck furniture, and offers a full range of sealing and restorative services. See Dirt Run!™ Inc. is an active certified member of PWNA, a member of the Better Business Bureau with an A+ Rating, the Chamber of Commerce, and operates under MHIC License #86481 and VHIC# 2705 126609. Interested parties should contact the office at 302-540-1243.